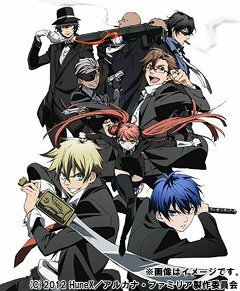 Mafia, fantasy otome PSP game gets anime adaptation! The story follows Arcana Famiglia, a self-appointed organization with mysterious powers that has protected “Gift”, a small Mediterranean island from pirates, foreign countries, and other threats. The leader of the family is planning to retire and his only daughter, Felicitá, will be married to the next head of the family in two months. The successor will be decided in a tournament, called “Arcade Duello”. The Famiglia Arcana uses the power of “Tarock” to protect the island, and only those with the power of the Major Arcana are entitled to participate in the tournament. Mysteries about the family that Felicitá wants to unravel will only be revealed to the winner and she too will take part in the tournament herself. According to Wiki, the Major Arcana (greater secrets), or trump cards, consists of 22 cards: The Magician, The High Priestess, The Empress, The Emperor, The Hierophant, The Lovers, The Chariot, Strength, The Hermit, Wheel of Fortune, Justice, The Hanged Man, Death, Temperance, The Devil, The Tower, The Star, The Moon, The Sun, Judgement, The World and The Fool. In the game, the names of these cards were written in Italian. The anime will premiere this summer with animation by J.C. Staff (works include Loveless and Uragiri wa Boku no Namae o Shitteiru). The anime will retain the cast from the original PSP game from HuneX (VitaminX Addiction) and tie-in drama CD project. Character relationship chart from the game site.